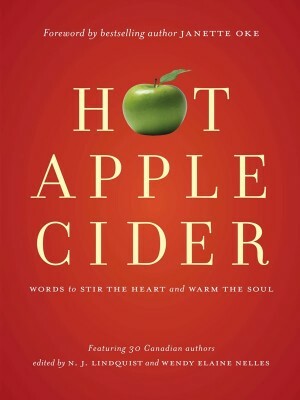 Hot Apple Cider: Words to Stir the Heart and Warm the Soul, is a 296-page collection of personal experience articles, short stories and poems. While there are similarities to the popular Chicken Soup for the Soul series, this book conveys a uniquely Canadian character and content, with a variety of stories from the light-hearted and humorous to those dealing with serious real-life issues such as the death of a child, cancer, infertility, loneliness and family conflicts. All contributing authors are professional members of The Word Guild, an association of more than 325 Canadians who write from a Christian faith perspective. They represent more than 20 Christian denominations. Whether you sip Hot Apple Cider slowly, one story at a time, or drink deeply and read it all in one sitting, these stories of fun, faith, and fellowship by gifted Canadian writers will warm your heart. Imagine a group of Canadians circled around a campfire. They have two things in common: they’re serious Christians and committed writers. ‘Let me tell you my conversion story,’ calls our Deborah Gyapong. Keith Clemons reads a short story and Brian Austin recites an original poem. Grace Fox shares a devotional piece. As the fire crackles and they sip their cider, all 30 speak from their hearts. That’s the concept of Hot Apple Cider – and it’s a good one.